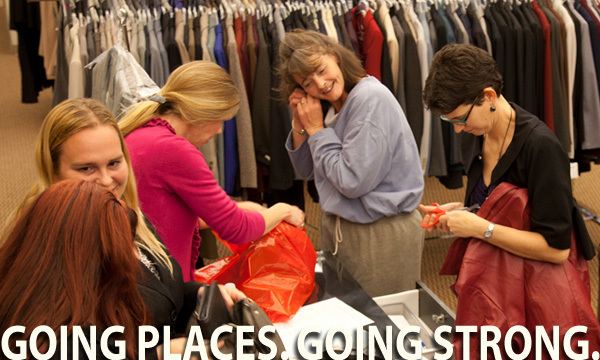 Volunteers are literally the only way it has been possible for Dress for Success Indianapolis to serve over 14,500 low-income women in the Indianapolis area who are returning to the workforce. Founded as an entirely volunteer-led and run organization, volunteers are still at the heart of everything we do. With a staff of only six full-time employees, an active volunteer base allows us to assist more than 1,500 women a year as they consistently provide over 5,500 hours of service each year. Thank you so much for your interest in sharing your time and talent with us! We are excited to have you join the over 400 women (and men) who make our programs possible. As soon as we receive and process your application, you will be invited to attend a Volunteer Orientation where you will learn more about our mission, history, services and how volunteers help to empower the women we serve. From governance to programs to events to operations, volunteers are involved in every aspect of our organization. Our Board of Directors is comprised of volunteer members, and all six Board committees are comprised entirely of volunteers. Volunteers also provide the majority of direct client services.